The Bridge Renewal Trust has been awarded funding from the Department of Work and Pension to deliver a one year programme to help lone parents get back into work. 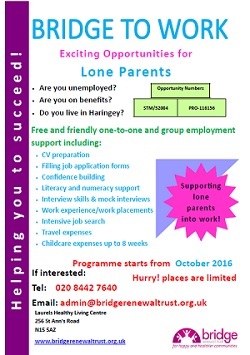 The programme offers free and friendly one-to-one and group employment support to lone parents who live in Haringey. The programme starts from October 2016 and will run for one year.